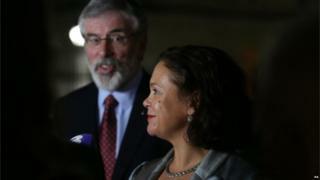 When Gerry Adams steps down as Sinn Féin president next year he will be replaced by Dublin Central TD Mary Lou McDonald. She is the only candidate to replace the Sinn Féin veteran, who has served as president for more than three decades. Mary Lou McDonald's personal story is very different from other leading Sinn Féin politicians. She comes from a middle-class background and was brought up in Rathgar, which is viewed as one of Dublin's most desirable suburbs. Ms McDonald went to a private fee-paying school and in her teens she became interested in politics, but it wasn't Sinn Féin that initially caught her eye. In the late 1990s, she joined Fianna Fáil in Dublin West and her political opponents say she was anxious to climb the political ladder. Former Labour leader Joan Burton, who is a TD in Dublin West, remembers her well. "She was certainly a very active Fianna Fáil member and then within a couple of years she had changed sides and joined Sinn Féin," Ms Burton told BBC Northern Ireland's The View programme. "The understanding locally was that she had wanted to run for Fianna Fáil." However, Mary Lou McDonald has said her switch to Sinn Féin was more about policy than personal ambition. Dublin TD Finian McGrath, who is now a government minister, knows her well and said she changed parties because she felt Fianna Fáil was not standing up for republicans. "She felt they were going away from the whole issue of Irish unity and Irish independence, and I think she was looking for a party that would reflect that view," he said. In 2002, Mary Lou McDonald was Sinn Féin's candidate in Dublin West, but she failed to win a seat in the Dáil (Irish parliament). However, in 2004 she made history by becoming the party's first MEP. Her role in Europe gave her a profile, and in 2011 she became a member of the Dáil for Dublin Central. 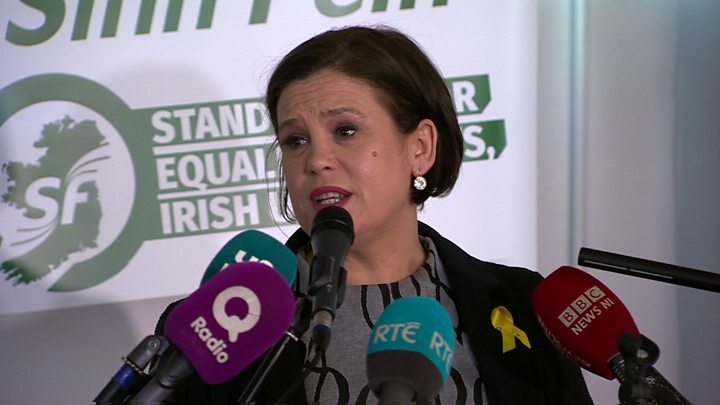 Irish Times journalist Mary Minahan has observed Mary Lou McDonald at close quarters, and said she is a tough-talking, determined individual - but also a "Marmite politician". "No-one is neutral on Mary Lou McDonald," said Ms Minahan. "You either love her or you hate her. She is a very forceful personality - well able to get under the skin of Leo Varadkar and go out battling against Sinn Féin's opponents in Leinster House." Ms McDonald's style has won her support from across the political spectrum. Former Fianna Fáil Deputy Leader Mary O'Rourke said her performances in debates and at Question Time have been impressive. She said: "I admire her for being in a male environment, which the Dáil is. She is gutsy and straightforward and up front and they are qualities which stand to help one in any environment, but in a male political environment she sure uses them and needs them." Despite the praise, her critics say her judgement sometimes lets her down. Some cite Sinn Féin's reaction to the case of Máiría Cahill, the Belfast woman who said she was raped and then shunned by the republican movement. "I was deeply disappointed," said Joan Burton. "I thought she showed very little empathy, whereas in the Dáil on previous occasions she has been extraordinarily sympathetic to women who have come through difficult situations." Sinn Féin has always insisted the party did everything to help Máiría Cahill and say their political opponents tried to exploit the situation. Last weekend, the party talked about going into government after the next Irish general election. That desire for power comes in spite of Fine Gael and Fianna Fáil ruling out Sinn Féin as coalition partners. Lise Hand, a political columnist from the Times newspaper in Dublin, said it would be a dramatic culture change for Sinn Féin if the party formed a government. "I think they will find it difficult to make the transition over to being a responsible member of government and part of a coalition with all the collective responsibility that goes with being in cabinet," she said. "They have a bit of growing up to do and that will be a very steep learning curve - but I do think Mary Lou would be up to the job." Asked if the current Sinn Féin deputy president would make an effective Tánaiste (deputy prime minister), Lise Hand smiled and remarked she would "make a feisty Tanaiste". Some, however, question whether the former MEP has the right experience. Joan Burton said Mary Lou McDonald is an unknown quantity when it comes to making decisions on the national stage. "She has never held office in the sense of being a minister or having a role to carry out. So she is untried and untested in that sense," said Ms Burton. Others insist that the Dublin Central TD has the right skills. Disabilities Minister Finian McGrath said she is well equipped. He told BBC News NI: "She would be very competent, very professional and I can see her handling the situation very, very well." 2004 was a landmark moment for Mary Lou McDonald when she became her party's first MEP. In the months ahead she could be making history again. Is Sinn Féin leadership a one-horse race?